Protect Your Home and Family from Plumbing Leaks, the Most Common and Costly Cause of Loss - Scarsdale Premier Insurance Agency | Advocate Brokerage Corp.
Like you, I often hear in the news about the destruction caused by wildfires, hurricanes, and other natural disasters. Certainly, their threat to life and limb deserves the utmost attention. But they are second-rate players when it comes to property damage to high value homes. The real villain is waiting quietly in the pipes running through your home, in your washing machine, water heater, and refrigerator. I’m talking about damage from plumbing system and appliance leaks. Based on an analysis of claims for the homes we insure, these leaks are the most common and costly cause of loss. We had one leak cause $130,000 of damage in just 30 minutes. Yes, you have great insurance in the event of such damage. But there’s still the prospect of many months of repair work, lingering concerns about mold, and a deductible payment. How do you avoid these worries? There is a very effective and economical solution — the Leak Defense System. The Leak Defense System detects leaks and shuts off the water supply to your home. While this is a great device to have in all homes, it is especially recommended if you own a second home that sits unoccupied during much of the year. Our job at Advocate is to help make sure that homeowners like you are properly insured and taking advantage of opportunities to minimize the risk of loss. We encourage you to call the manufacturer of the Leak Defense System, Sentinel Hydrosolutions, at 866-450-1190. If you are an Ace customer, Mention “A3” and tell them you are an ACE Private Risk Services client so that you can earn a special discount. They will explain how easy it is to install their device. 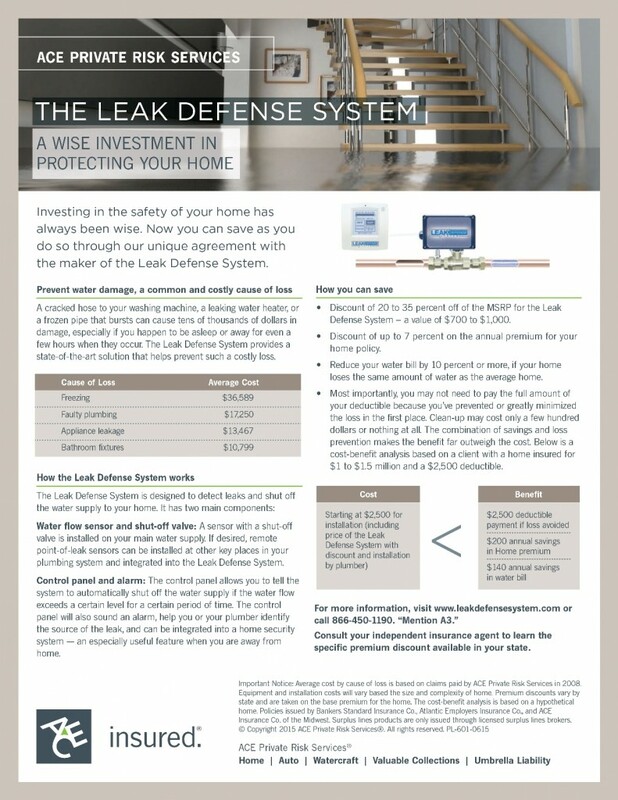 You can also go to www.leakdefensesystem.com to learn more.